The Las Vegas Open is a local meet dating back to 2002. It’s now being hosted right here at Avergae Broz’s Gymnasium. Current competition format has two divisions: The first one is for non-USAW members. This includes Crossfit athletes or anyone who wants to lift in a meet without joining a federation or wearing a singlet. Shorts that reveal the knees and a short sleeved T-Shirt is all that’s required. There are no minimum standards or qualifiying totals, so it’s open for all ages and skill levels. Judging for the actual lifts follow IWF Competition Rules. Weight categories used are IWF Open / Junior classes. The second division is for USAW members. This portion obviously conforms to IWF Competition Rules. The totals are official and are used toward qualification for National Competitions as well as yearly rankings on the USAW website. Depending on the number of lifters participating, there are normally four sessions. The First two are for Men and Women with lower posted entry totals and lift earlier in the day, whereas the higher entry totals compete together in afternoon sessions. There are five warm-up platforms all equipped with Eleiko Barbells and Discs. 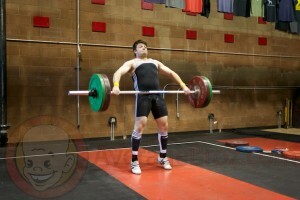 The barbells used for the actual competition are new Eleiko bars that we only use for this event each year. It’s always a pleasure to see how many people come from all over the country to lift at this meet. The most unique part is when people register the morning of because they are not sure how they will perform after a typical Vegas night on the town.